Righto, I think that might be time to say goodnight. Well done Jason Day, no longer the best player never to win a major championship. And nobody handed it to him, he went out and won it. Jason Day speaks to Sky Sports: "You guys saw on the 18th hole, even before I finished I had tears coming out of my eyes. I don't need to think about anything else now, it's such a special moment. I've just got to soak it in. "I drove the ball so good and hit a lot of greens. I was patient in myself and disciplined. Everything mixed together it worked out perfectly." So, that's the 2015 major championships done and dusted and we got three quality winners. It's exciting times for golf, we have a new world number one in Jordan Spieth, who is only 22; an old number one in Rory McIlroy, who is only 26; a new major winner in Jason Day, who is only 27. Chuck in lots more coming men, and golf is looking fresher than for a long time. Jason Day addresses spectators in his first interview at the side of the 18th green: "It's been a long journey. I didn't expect to ever grow up and be on the PGA Tour, it's an amazing feeling. "I didn't expect I was going to cry. A lot of emotion has come out just because I've been close so many times and fallen short. To be able to play the way I did today in tough conditions with Jordan in the group. He was the favourite, to be able to play the way I did was amazing. "Overall I'm just really pleased with how I played, I couldn't ask for anything better." Brian Gaffney gets a glass bowl for being the lowest club pro, he finished on +5 after a 71 and was the first club pro to make the cut since 2011. And now Jason has the handsome Wanamaker Trophy in his mitts. Up it goes, the Queenslander deserves it, he's grafted like a dog to land a big one and after so many near misses, his dream has finally come true. "When you think back to the US Open, with the attack of vertigo and we really feared for Jason Day's health, it's an extraordinary story." So, Jason Day is the first Aussie since Steve Elkington in 1995 to win the USPGA and only the fifth Aussie in all. He is also the 11th Aussie winner of a major. His -20 total also breaks the record for the lowest under-par total in a major, beating Tiger Woods's -19 at the 2000 Open. "It was a wonderful effort. he was pretty much in control all day. He never really looked like he was wobbling. The only time was the second shot on nine and the he went on to save par, that was a huge turnaround, a big turning point in the day." "There is not a dry eye in the house as Jason Day becomes a major champion. His son runs onto the green. It's dad and son as they celebrate a major victory which has been a long time coming." And Day pops it in - finally he's bagged one of the big ones, after nine top-10 finishes. Tremendous stuff, and not before time. "Day is in floods of tears, it's a good job he only has a six-inch putt to knock in." It's some setting for a maiden major, the sun beginning to lower over Lake Michigan and the galleries full to the brim. Day's wife, Ellie, and son, Dash, await him behind the green. As is usually the case when an old man does something he thinks is very special, his little boy is far more interested in a disc his mum is waving in front of his face. He'll understand one day, he won't be able to miss the Wanamaker Trophy stuck on top of the TV. Day cosies the ball up towards the hole before breaking into tears, breaking your duck can be a little bit overwhelming. "Well done Branden Grace, $680,000 will land in his bank account." Listen to the final strokes of this championship on BBC Radio 5 live by clicking the live coverage tab at the top of this page. Rose's par effort is majestic, but it had too much work to do. It's a bogey at the last for the Englishman, a round of 70 and -14 overall. Grace pips him for third with a par, the South African finishes one ahead of -15. Spieth from a little closer than Day but he doesn't get the pace right, he's got a nervy one for par. Spieth is a very likeable chap, some of his little exclamations have a comic book innocence about them, so the fans are pleased to see that par putt finally get gobbled up after circling the drain. Day makes par, stays three clear. Birdie for Grace on 17, he joins playing partner Rose on -15 and a tie for third. Dustin in with a 69 that included a quadruple eight and two eagles. Never let it be said that Johnson serves up the predictable. "There's around about 800 yards of golf to play but looking ahead I think it'll be a really emotional 18th green when Jason Day gets that major win." "This eagle putt for Jason Day, this is a big moment, were this to go on I think his fat lady would be singing merrily." You can listen to Iain Carter and Jay Townsend by clicking on the live coverage tab at the top of this screen. "A fantastic week for Anirban Lahiri who has won twice on the European Tour this year. A fantastic talent and his game is just growing all the time." Branden Grace with a crackerjack tee shot at 17, having missed a three-footer for birdie at 16. Lahiri is in with a 68 after a bogey at the last and has a share of the clubhouse lead. Currently tied for fifth, that makes it the best finish by an Indian in a major, beating Jeev Milkha Singh's tied ninth at the 2008 USPGA. Day would be the 11th Australian major winner, and a Day victory would be Australia's 17th major in all. Four Aussies have won the USPGA - Jim Ferrier won at Plum Hollow in 1947, David Graham at Oakland Hills in 1979, Wayne Grady at Shoal Creek in 1990 and Steve Elkington at the Riviera Country Club in 1995. George Coetzee of South Africa is in with a 67 for the clubhouse lead on -12. Spieth with 192 left at 15, six iron... his ball doesn't do what he tells it to and it comes up short. Day fizzes his second out of the rough and over the back, but he should get up and down from there. It wouldn't be a major championship if a few footballers weren't taking in golf drama and uploading their views onto social media. No. 15 - 'Grand Strand' - the fourth hardest hole on the course this week. No. 16 - 'Endless Bite' - the easiest hole on the course. No. 17 - 'Pinched Nerve' - sixth hardest hole on the course. No. 18 - 'Dyeabolical' - the hardest hole at Whistling Straits this week. "He's leading by four. In charge of the final major of the year." Brooks Koepka is putting some round together, a birdie at 16 has taken him to -7 for his round and 14 under for the week. 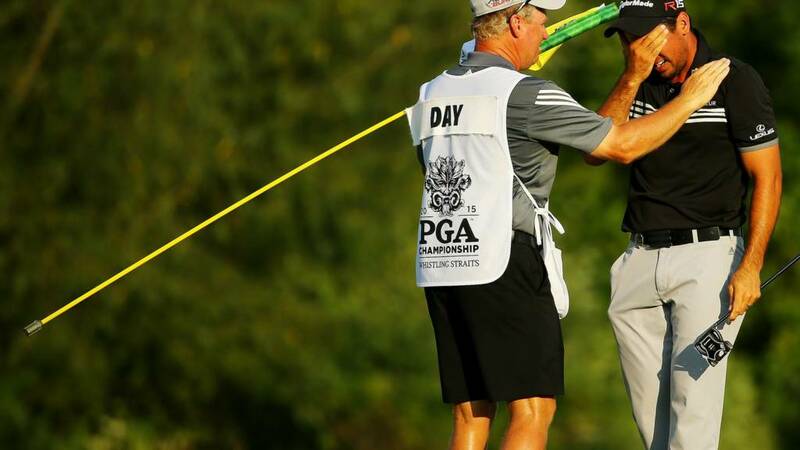 The world number 20 is having a very good season, having won his first PGA title in February. By the way, if things stay as they are, Jordan Spieth will end Rory McIlroy's stint as world number one. Rose on tee at 14 after that double at 13 and it's straight down the middle. McIlroy at the last and he's in for a 69, nine under and tied for 16th as it stands. Not bad at all from the world number one, having snapped his ankle in half six weeks' ago, that's four under-par rounds. Day finds the bunker at the par-three 12th, looks like the wind took that. Spieth with a chance to close the gap... all over the flag, that was ballsy, he's got a chance of a birdie while his playing partner is trapped. This could be Rose's race run - horror lie in a bunker up at 13 and he can only just nudge over the rim. I think we have officially entered Chokesville territory, if Day gives up a four-shot lead with seven to play, he will forever be remembered as another Aussie who threw a major away. A 69 for Mickelson today, and another top-20 finish in a major, as things stand. "Rose is playing quite beautifully. He's picked up four shots through his 11 holes today, no bogeys. He does have a good record of coming back from behind to win tournaments, he's done it four times on the PGA Tour." A triple at nine took the sails out of Tony Finau's challenge but he's doing his best to dig his way back, he's just made eagle at 11 to get to 10 under again. George Coetzee of South Africa has birdied the 15th to get to 11 under, currently in a tie for sixth. "You never make up for a bogey it's on the card but you do make a birdie, that's a separate incident. The birdie gets you just that, you never get the bogey back." Spieth takes a while to settle over his putt before bending it in, he gets to 15 under and is three behind Day, level with Rose. Rose with a horror lie in a bunker at 11 and all he can do is nudge it back onto the fairway. McIlroy over at 16 and he's into the guts of the green in two. Day has got 10 feet for birdie at 10 and leaves it short. Spieth has a foot in the door, can he blast it open with a birdie? What goes through the mind of this man? Dustin Johnson made quadruple bogey on the first hole and two more bogeys before the fifth hole. Did he crumble? Nope. Five birdies and an eagle later he's on 10 under. Just imagine if he'd started solidly, he'd be right in this. Major Sundays are never dull with this guy. A two for Dustin on 12, he's back to -11 - were it not for that quadruple at the first, he'd be right in the mix. As it is, his reputation as a swallower continues to grow, however fairly or unfairly. Increasingly it's looking like only three men in the field are close enough to take down Day - Rose of England, Grace of South Africa and Spieth of the United States. Steele in with a 67 for a share of the clubhouse lead on 10 under. Suddenly people are faltering, Jordan Spieth makes bogey on nine, his par putt slides away. Branden Grace is collapsing on 10, fluffing a chip from the rough to leave his fourth shot on this par four from the ugly stuff. He has a bogey putt but leaves it short and it's double. Farewell Branden perhaps. If Jason Day can make par now he gains big time... he does. Well judged. So over to you Justin Rose, this is a putt for birdie, second on the leaderboard to be three off the lead... straight in. Jason Day becomes a club hacker very briefly, hacking into the turf several inches behind the ball. He caught that one fat to say the least and from a perfect position on the ninth fairway he now has a tough pitch to get up and down for par on nine. To quote former England manager Graham Taylor, "this is a test". Beautifully judges to leave six feet. Jordan Spieth leaves a similar putt. Neither man will fancy these. Matt Kuchar gets the "Kooochh" call from spectators. Why? He sinks a short putt on 11 for eagle. Incredibly he's now on 13 under and in fifth place. "If it does go to a play off it would be a three-hole play-off using holes 10, 17 and 18." You can listen to Iain Carter, Jay Townsend and Eilidh Barbour on BBC Radio 5 live right now by clicking the live coverage tab at the top of this page. Jordan, oh Jordan, stop pointing right off the tee box. His ball finds the thick rough and on this ninth hole, that's problems as the green is hidden away. Jason Day likes what he lampoons up the fairway - that's prime location. You have to find the fairway on these harder holes so you can generate spin to hold the ball on these greens. On the green, Branden Grace and Justin Rose are in for pars. That's a great up and down for Rose. Jordan Spieth has bang on 30 feet left on eight and it will break late to the right, it does, the weight is perfect and... and... won't drop. It trickled across the front of the cup and he dances on the spot and begs it to drop. Jason Day cannot convert his par putt, that wayward drive claims a stroke. Justin Rose, head bowed, talks to himself and these are words of anger. His ball on nine rips off the club but he starts waving his hands in protest immediately. Bounce, bobble, bunker. And he's short sided so getting out of that trap and near the pin will take a minor miracle. Bogey is very much in play. Branden Grace is on the green and has an outside birdie chance. He has to post a number as Jason Day isn't going to come backwards through this field. Don't speak too soon. He has to play out sideways from a bunker on the eighth and has 156 yards left into this flag for his third - it's a par four. It looks like a full swing and it makes the putting surface but leaves 20 feet. Could be bogey. Jason Day finds bunker from the tee on the eighth which at over 500 yards will now ask him a question or two. Jordan Spieth is position 'A' but he needs to find something big now - three back. Up ahead on the green, Branden Grace and Justin Rose must have heard the noise generated by Day's putt on seven - they make pars. That putt from Day was something else. He can't lose it from here can he? This is the moment, this is the moment we will look back on surely. Jason Day has over 40 feet to the pin on this seventh green. He has to be kidding us. What a putt. What a body blow, incredible. The Australian bounces off to the next tee and doesn't even watch Jordan Spieth make par. The adrenaline running through his body could fuel your car for the next week. American golf journalist Alex Miceli on BBC Radio 5 live: "I anticipated that it would be hard to score because of the hole positions but the one thing you can learn from this tournament is that it really doesn't matter if the scoring is low, as long as the golf is entertaining." Justin Rose looks disgusted on the eighth hole as he leaves a long way for birdie. "You can't expect to land it any softer than that, it's a wedge, that's my fault," says the man on his bag. Rory McIlroy must get up and down from the bunker on 13 if he is to stay at nine under. McIlroy is three under today and looking solid but his chip here leaves 20 feet for par. Could be one back for the course here. He's currently tied 15th. Where will the mistakes come? "Get in the hole", goes the cry from the spectators as Jordan Spieth whips one out of the rough on six. It nears the hole, this would be eagle... the roars grow and grow and then comes "ooohhh". Just two inches the wrong side of the cup and a birdie putt will follow. Jason day must make birdie from where he is on the green, it's four feet. AND WE HAVE A FIST PUMP - it's Branden Grace on seven. He drains the life out of a 15 footer for birdie - three in a row. Want another birdie? Fair enough - Anirban Lahiri on nine with a lengthy putt. Back to Spieth... nails it. Dear me this is like a birdie disco, the lights are blinding me... Day... birdie. He responds to everyone trying to haul him in. Jason Day gets a juicy kick out from the rough on six. He will surely make birdie here as this hole is as easy as they get at this level. His tee shot is left of the fairway but kicks back onto the lovely short grass. Jordan Spieth is shouting "left, left" at his ball as he tries to drive this green. Such a big ping off his club face and he goes through the green but has nice position. I can tell you Justin Rose and Branden Grace have hit solid shots into the seventh green off the tee - birdie hopes grow. Phil Casey of the Press Association gives his view as both Branden Grace and Justin Rose make birdie on this very welcoming hole. They both hit it further than the average 285 yards Y.E Yang has managed of the tee in this tournament. Spieth... right to left with mild break... super, super putt for birdie. That could be key, it ramps up the pressure on Jason Day who places his ball on this green. Get that out of your mind Jason, play your own game... it's nine feet in all, deep breath... hugs the edge of the cup and gravity takes it. Birdies all over. Ugly, ugly ball for Jordan Spieth. It sits in rough at a crucial stage on this par five. His third shot will have to be inventive and he pumps it along to run to the flag but it's short. In this game of chess Jason Day can get in closer than his rival here. Day is middle of the fairway with a wedge in his hand and he leaves six feet for birdie. The lead could grow here. Day is inviting the punches and countering. "Justin Rose is doing the exact right thing in just trying to chip away at this lead." Tony Finau continues to refuse to go away. This big fella - 6ft 4in - shows gentle touch as he chips on the par-four fourth to leave a tap-in birdie. Justin Rose and Branden Grace follow him up that hole and the green is reachable off the tee here. Neither make it but their balls are well positioned. There are two players in the clubhouse sharing the best score of the day so far. American pair Ryan Moore (pictured) and Kevin Chappell shot five under - 67. Here's a man looking like he has the putter on flames... Branden Grace. What a stroke on five, it's long, breaking and in from 33 feet. Is Justin Rose's putter toasty? You bet. No slippery margarine in sight here, straight in. "Go hard please," says Jason Day as he tees off on the fifth - a par five - bunker time. Lots of room to haul that back on this long hole. Jason Day will feel good as he sees Jordan Spieth make just bogey on four. A three-shot gap with 14 holes to play in a major - he'd have taken that on Thursday. Do my eyes deceive me? Jordan Spieth under hits his par save on four by some distance by his standards and he will make bogey at best. Jason Day, to land a huge blow for birdie from range... no. Never on the right line. It was a timid effort to say the least but par scratches another hole off. Jordan Spieth will need to get up and down to save par on the fourth. It's a touch over 100 yards for him but with his wedge game, he can place a ball on a bit of dust when needed... not this time though as he goes over the flag to leave 25 feet for par. Far from ideal with Jason Day on the dance floor with a lengthy birdie putt to come. Martin Kaymer, has he surrendered after his double bogey? Looks like it, over the green on five with his third. You have to bank the par fives today and he may only end up with par at best. Cheers Ben. Thoughts on the early jabs folks? Keep in touch with us on #bbcgolf. Is this a straight contest between the top two or can someone win this from outside of the lead group? "That was a great birdie two at that difficult par three. Jason Day holed a really nice par putt too, probably more difficult than Spieth's. It looks like both guys are under control of their emotions so far. As we creep nearer the 18th hole, that's where the nerves ratchet up a little more." Lahiri drains a birdie putt from range on five, moves to 11 under. it's Day to go first, this is a ticklish one... makes it drop, it wasn't as far as eight feet, but he still needed to do a job on it. Spieth for his 86th birdie this year in majors, needs this... and gets it, moves to -14 and back to within two of Day. tweet on Saturday night has proven quite inaccurate. The American is five over par for his round after four holes. Kaymer can only nudge his ball forward at the fourth, it's damage limitation from now on. Day at the par-three third... draws it a little bit too far, onto the fringe. Spieth stiffs his to within four feet of the cup. Whatever you can do... Kaymer has got about seven feet left for bogey at four, could be two shots gone. It would be harsh to say Jason Day's 'nearly man' tag is due to his nerves getting the better of him - the term 'bottler' is certainly unfair. In placing second at the 2013 US Open he came from eighth place after round three but fell two shots off winner Justin Rose. At the 2011 US Open he again finished second but stood no chance as Rory McIlroy led by a mile going into the final day. And at the 2011 Masters, Day posted 12 under with Adam Scott but Charl Schwartzel birdied the last four holes to win by two. "That's a huge blow for Day to strike." Kaymer gambling at four, thrashing out of the rough with three wood and finding sand. Spieth has a 10-foot par for birdie at two... borrows an inch too much, stays -13. Day with a chance to go three ahead, as Grace bombs in a longun at three to join Spieth on -13. Rose makes par, stays -12. Victor Dubuisson is five under for the day through 12 and eight under overall. Day makes par at the first, stays two clear on -15, as Spieth also makes par. Kaymer with a beautifully paced birdie attempt at two, taps in for par to stay -11. Breaking news... Billy Horschel - started eight under - shared the design on his trousers with the world of Twitter but after a double bogey on the second, his mood may now not be as vibrant. Horschel tweeted: "Going to need a shark like attack to win today! What do you think about the pants Greg Norman?" replied: "Love your style and w/pants like that Attack every hole and go low. Good luck. Play hard." Here they come, the main event of Day and Spieth. These two also played together on the final day of this year's Open - both men needed a birdie at the last to make the play-off, and neither man could manage it. Rose from the middle of the first... cosies his ball up behind playing partner Grace, both men with birdie chances. McIlroy makes birdie at six, gets to seven under. Kaymer for birdie at the first, from eight feet... just grazes the hole left, he stays 11 under and four back. Louis Oosthuizen in with a 69 for four under. And make no mistake, Jason Day feels right at home here. Much has been made about his nine top-10 finishes in majors but the first of those arrived at Whistling Straits in this tournament five years ago. How has he reached this point this week? Good length off the tee - an average of 306 yards. Accuracy off the tee - finding the fairway pretty much three times out of four. And, finally, hitting the green with 78% of his attempts. It's been classy and this man who knows how to go close, may finally get it done. Here's Branden Grace with his drive at the first, safely away. Justin Rose, the lone hope of the United Kingdom, pings his drive down there and gobbles up Grace. Both men in position A1. He hit it how far? McIlroy can't get anything going today, he's started with five straight pars and he really needed to come exploding out of the blocks to have any hope at all. Kaymer with a fine bunker escape at the first, as I hear that Dustin kicked off with an eight, which saw him drop into a tie for 29th. Martin Kaymer won the US PGA at this course five years ago on a day when, like today, he began his round four shots off the pace. Kaymer loves it here and has said Whistling Straits is the best course he has played in America, so there are plenty of reasons why he can come up trumps. India's Anirban Lahiri has birdied the first and is 10 under, five off the lead. Dustin Johnson making a real mess of the first, he's just left two bunker shots in the trap... make that three... I'll keep you posted, suffice to say he won't be breaking his major duck this week. Bubba's having a go today, and it's having mixed results - bogey, bogey to start, birdie at five, eagle at the par-four sixth, three birdies from 10 to 12th. As I write, he's just driven his ball through the back of the 13th - that's 430 yards. Difficult to get your head around to be honest. Another birdie for Justin Thomas at the fifth, he moves to nine under par. And here's Mickelson, splashing in for eagle at six! Lefty had missed a few chances before that, but look at that face, the befuddled grin of a man who doesn't quite understand how he manages to do what he does. He's seven under. Justin Rose talks to Sky Sports: "Yesterday was all about staying in position. I've done that. I'm a few back but there's a chance. The breezy day should make it interesting. If one of the chasing pack post a score it will make it tough for the leaders. "There's no margin for error with the wind up. Hopefully my ball striking will carry me through." What score could get the job done? "In the 60s, maybe 68 on the higher end of things. We'll see what we can do." Golf correspondent Iain Carter is joined by former European Tour player Jay Townsend and Eilidh Barbour from 20:00 BST. You can listen through your radio or by clicking the live coverage tab at the top of this page. Jordan Spieth is on the putting green, he's like a well-oiled factory machine. Putt... in... putt... in. He's working on the line of his stroke and the man on his bag Michael Greller is charged with collecting the balls from the cup. Jason Day is on the range hitting irons with a big pile of balls. These are crucial times for these players, get that swing loose, kick any clutter out of the mind, deep breaths. They will tee it up in under 45 minutes. Day tells Sky Sports: "Right now I've just got to focus on the process and get the preparation correct. "I'm really excited about today, it's going to be a lot of fun. The challenge of playing against Jordan and the guys behind. It'll be tough, the wind is up but to make it as stress-free as possible will be nice." A quick reminder that should Jordan Spieth win tonight he will become world number one. And, if he or any of his compatriots lift the Wannamaker Trophy, the United States will be home to all four major champions in a season for the first time since 1982. To take your mind back to 1982 briefly, in August of that year, Dexys Midnight Runners topped the UK charts with 'Come on Eileen'. Tune. Sergio Garcia's hunt for a major continues, the Spaniard, who announced himself to the world by duelling with Tiger Woods at the 1999 US PGA, is in with a 70 for level par overall. Brendan Steele of the United States birdies four, five and six and is eight under, joint lowest on course. Justin Thomas, he of the radioactive trousers, is two under after his first three holes and the lowest currently on the course, eight under. Former Masters champion Charl Schwartzel birdies three to get to seven under, McIlroy pours in a good saver to remain six under. The winner today will pick up a whopping $1.8m. That's around £1.15m. This season, Jordan Spieth has pocketed close to £6m in prize money alone, and you can bet those blue chip companies are fighting to throw more money at him. England's Paul Casey at three and he stiffs his tee shot to within eight feet. McIlroy for birdie at two but it dies at the last moment, he stays -6. Louis Oosthuizen, who lost out in a play-off at this year's Open, is four under after 14 and five under for the week. The South African was fancied this week but has left his charge too late. An ugly end to the week for England's James Morrison, who carded a 78 today. The Surrey golfer is propping up the leaderboard on nine over, although just making the cut on debut is something to be proud of. Many great players didn't. It hasn't been a great year for French Ryder Cup star Victor Dubuisson but he's having a good US PGA - he's three under after seven and six under for the week. McIlroy parred the first and here he is going for the green in two at the second... finds a horrible little bushel. There's a 15mph wind out there and not many going low, but good scoring is possible - Steve Stricker is five under after 12 and seven under overall, Ryan Moore and Kevin Chapell are in the clubhouse after 67s. Australia's Jason Day, who has a host of near misses in majors, leads on -15, two ahead of American Jordan Spieth, who is bidding to become only the third man to win three majors in the same year, after Ben Hogan and Tiger Woods. South Africa's Branden Grace and England's former US Open champion Justin Rose are one further back, one ahead of Germany's Martin Kaymer, winner of the tournament the last time it was played on this course in 2010. Day and Spieth go off last at 19:45 BST, Grace and Rose at 19:36, Kaymer and American prospect Tony Finau at 19:27, American Dustin Johnson and Australia's Matt Jones at 19:18. World number one Rory McIlroy, nine shots back overnight, teed off at 18:15. Who's your money on?